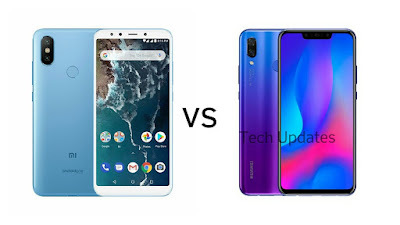 Xiaomi Mi A2 has a Metal body compared to Glass body on Huawei Nova 3i. Mi A2 has 5.99-inch 18:9 FHD+ Display whereas Huawei Nova 3i has a 6.3-inch (2340 x 1080 pixels) Full HD+ 19:5:9 2.5D curved glass display, Mi A2 is powered by Octa-Core Snapdragon 660 processor with 4/6GB of RAM with 64/128GB of internal storage compared to Octa-Core Kirin 710 12nm Processor with 4GB RAM and 128GB internal storage. On Camera, Mi A2 has a 12-megapixel rear camera with f/1.75 aperture, Sony IMX486 sensor along with a 20-megapixel secondary rear camera with Sony IMX376 sensor to capture depth information for portrait shots with AI and 20-megapixel Sony IMX376 sensor for the front camera with soft LED flash whereas Huawei Nova 3i has a 16-megapixel rear camera AI scene recognition that can detect over 500 scenes and the 24-megapixel secondary rear camera for portrait shots. It has a 24-megapixel front camera along with a 2-megapixel secondary camera. Xiaomi Mi A2 is packed with a Packed with a 3010mAh Battery whereas Huawei Nova 3i is Packed with a 3750mAh battery with fast charging support. Xiaomi Mi A2 comes in Lake Blue, Gold, Rose Gold and Black colors is priced at Rs. 16,999 for the 4GB RAM with 64GB RAM version, and the 6GB RAM with 128GB storage version will be available soon. Huawei Nova 3i has Dual front Camera, Glass body, Notch Display and bigger battery whereas Mi A2 comes with Android One program lacks 3.5mm Audio Jack.